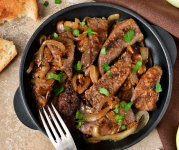 Beef liver is packed with nutrients, but it also collects the bad stuff, so using chemical- and hormone-free organic meat is particularly important here. Also, take care not to overcook the liver or it will toughen. You can prepare the onions ahead of time and store them in the refrigerator, then gently reheat them as you cook the liver. 1. For the onions: Melt 3 tablespoons of the butter in a large, heavy skillet over medium-low flame. Stir in onions. Cook them slowly, stirring often, until they are limp and golden, 15–20 minutes. Sprinkle the sugar over the onions plus some salt and pepper to taste. Continue cooking until onions are golden brown (but not scorched), 5–10 more minutes. Stir in the cider and vinegar, scraping up any onion bits from the bottom of the pan and incorporating them into the onions. Set onions aside while you cook the liver. 2. For the liver: Heat a large, heavy skillet (cast iron works well here) over medium-high flame for several minutes. While the pan is heating, pat the liver with paper towels to remove some of the surface moisture. Season them generously with salt and pepper and then dredge them in the flour, shaking off the excess. When the pan is hot, add the oil and remaining tablespoon of butter, and swirl to coat the pan bottom. Add the liver steaks and sear them on the first side for 2 minutes. Turn them over and sear on the second side 2 minutes. They will be cooked rare at this point. Reduce the heat to low and continue cooking to desired doneness. Transfer the steaks to a serving platter. 3. To finish: Stir the onions and parsley into the steak pan, scraping up any bits of meat on the bottom and incorporating them into the onions. Spoon onions over the meat and serve immediately.